There has clearly been a political awakening in this country and people are once again motivated to make their voices heard in regard to political policies. When it comes to protecting our nation’s health and maintaining our personal freedoms, there are plenty of differences in opinion. In a recent VaxTalk podcast hosted by Voices for Vaccines, Every Child By Two Board Member Sarah Depres and Immunize Texas member Jinny Su, discuss the potential impact proposed federal and state policies could have on the health of our nation and our local communities. More importantly, they explain how everyday citizens are being encouraged to actively engage with their legislators on these issues. To start, Ms. Depres explains how the American Healthcare Act and the President’s proposed budget may impact the availability, accessibility and affordability of immunization services across the country. While these policies are still evolving, she comments that the proposed plans suggest significant budget cuts will be made to the U.S. Department of Health and Human Services (HHS) and the Centers for Disease Control and Prevention (CDC). These two federal agencies are currently responsible for the majority of federal immunization programs and vaccine oversight. A reduction in their operating budgets will likely have a significant and fairly immediate impact on things such as vaccine safety and oversight, disease surveillance, outbreak response, scientific evaluation of effective immunization practices and research that helps us to understand what interventions work to improve vaccination rates across the U.S.. While some may argue that we can save money by streamlining budgets and consolidating programs, there is a larger concern that must be addressed and it has to do with state level immunization programs. The fact is that the collective work of these agencies has a direct impact on individual state efforts to provide good immunization services to the public. 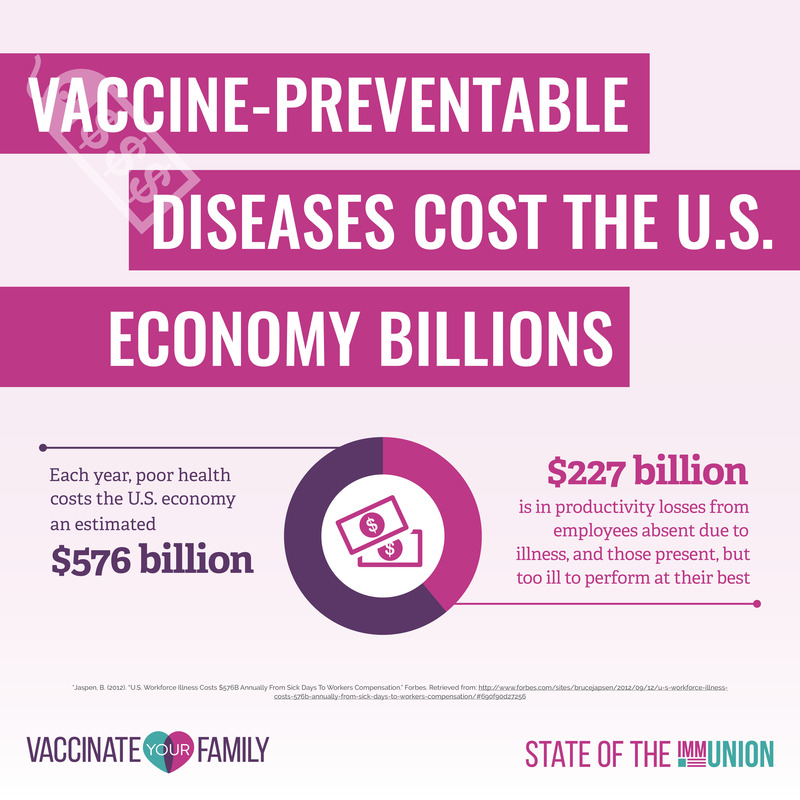 Not only do states benefit from the large-scale research and oversight that the federal government conducts on vaccines, but a large portion of these federal funds trickle down to assist states in their specific efforts to prevent outbreaks that can easily cross state lines. As Ms. Depres explains, infectious diseases have no borders and it is therefore unrealistic and, quite frankly, unacceptable, to put the bulk of responsibility on the states when they are not in the same position that the federal government is to fund large scale programs that we know benefit the country and its citizens as a whole. Take the state of Nevada as an example. Nevada continues to rank at the bottom of the list for public health spending with just $4.10 per capita and they also happen to be a state with some of the lowest immunization rates in the U.S. In comparison, Idaho, their neighbor to the northeast, spends as much as $94.70 per capita. When The Affordable Care Act was established, it included the Prevention and Public Health Fund (PPHF) to sustain and expand preventive health measures and save the country money typically spend on illness and disease. Fortunately, this fund has supplemented Nevada’s budget with more than $31 million since the fund’s inception, and has had a direct impact on the programs being developed to ensure vaccine access across the state. Unfortunately, with the repeal of the ACA, the PPHF funds are at risk of being eliminated, and Nevada will likely suffer major public health setbacks as a result. As federal policies continue to be negotiated by Congress, we’re also seeing an increasing number of states that have proposed new immunization related bills during their 2017 legislative sessions. Following the Disneyland measles outbreak of 2014, there has been increased interest in implementing policies that may deter people from filing for school vaccine exemptions and thereby increase vaccination rates above the herd immunity threshold. This is often done by suggesting a complete elimination of non-medical school vaccine exemptions or by requiring an educational component be completed before a school vaccine exemption is approved. Yet, every bill has it’s opposition, and in some states there are people trying to add philosophical or religious exemptions to make it easier for parents to skip school required vaccines. There are even some pushing for a complete ban on vaccines under the misinformed premise that they contain unsafe ingredients, and others suggesting that “informed consent” should require lengthy legal information be shared with parents prior to a vaccine being administered to children. In some cases, states are suggesting that childhood vaccination rates be publicly posted to school or country websites to help inform parents of schools with high numbers of vaccine exemptions that may put students at increased risk of disease. In the state of Texas, as an example, over 41,000 school aged children have non-medical vaccine exemptions. Large pockets of unimmunized children can easily threaten herd immunity thresholds for diseases like measles and pertussis, which then in puts constituents at an increased risk of disease outbreaks. This is why VaxTalk invited Jinny Suh from Immunize Texas to discuss the actions that are being taken in Texas and how individuals can become involved in supporting strong pro-vaccine legislation in their own states. When it comes to both federal and state level immunization policies, legislators are often inundated with testimony from vaccine refusers, many who claim that vaccine mandates are an affront to personal freedoms and that parents ought to have the right to make medical decisions for their children regardless of their impact on public health. Some vaccine refusers will argue that vaccines are dangerous and will therefore reject the overwhelming scientific evidence that has proven vaccines to be safe and effective. While these extremists may only represent a very small number of constituents (typically less than 1% of the population), they continue to be relentless in their pursuit to capture the attention of legislators with calls, emails and even personal visits. 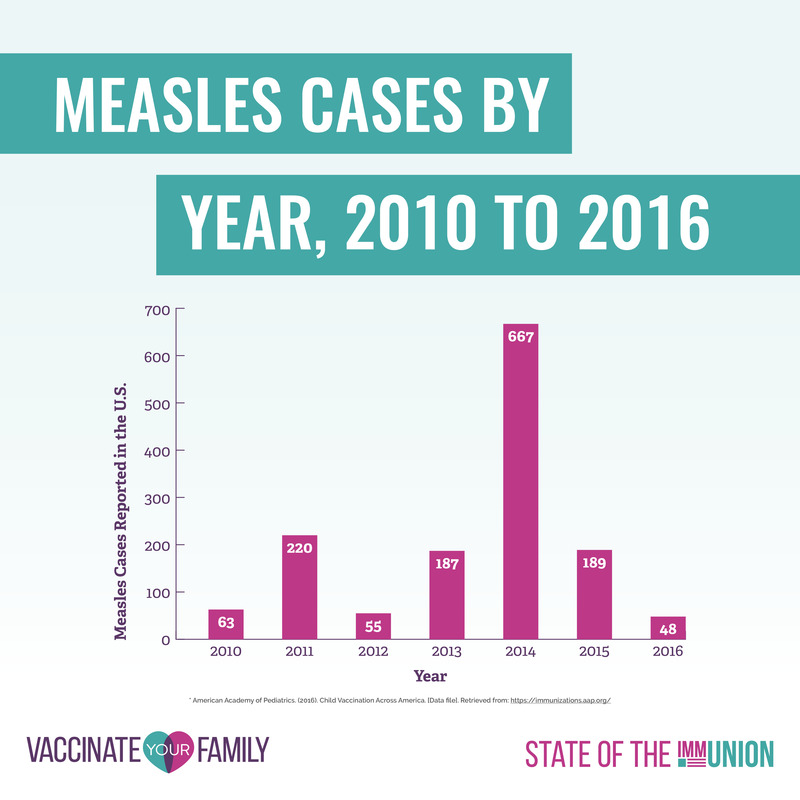 In order for us to preserve the foundations of public health and counter this dangerous rhetoric, legislators need to hear positive immunization messages from the overwhelming majority of people who vaccinate. As healthcare reform remains a hot topic on the Hill, and state legislators continue to contemplate various immunization bills, individual vaccine advocates are being called to connect with their federal and state legislators to let them know that they expect their representatives to do everything they can to protect their constituents from dangerous and life-threatening preventable diseases. Familiarize yourself with the proposed federal policies and why they present a challenge to the public’s health. You can start by listening to the latest VaxTalk podcast, reading past Shot of Prevention blog posts that explain the role of the federal vaccine oversight committees and the challenges that we are facing due to the possible elimination of the Prevention and Public Health Fund. Sign the petition that Every Child By Two continues to share with Congress that urges the retention of crucial public health funding. 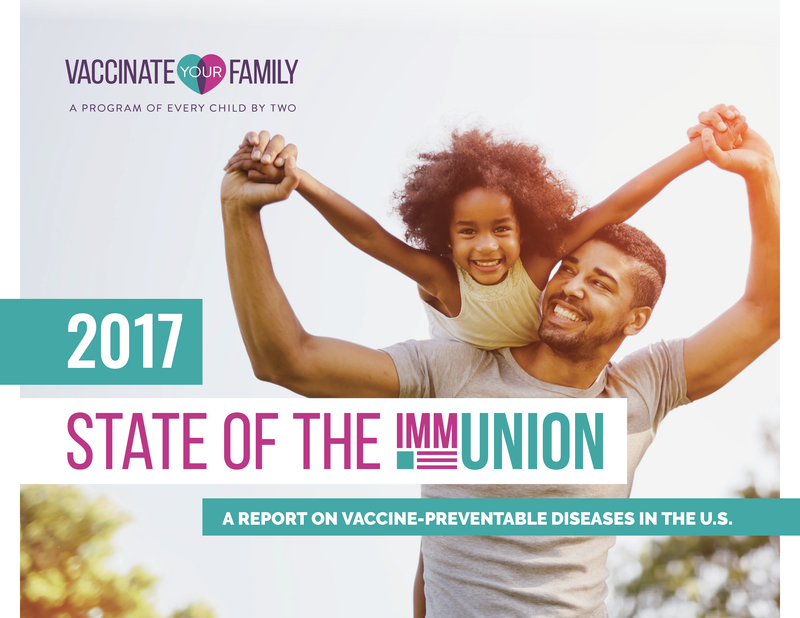 Read Every Child By Two’s 2017 State of the ImmUnion report and share with your representatives so that they can become better informed about the value of vaccines and our nation’s immunization successes and shortfalls. Show your support for vaccines by contacting your Congressional representatives. Simply click here to find the contact information and then use this information to call or send a brief email today letting them know that as a constituent, you are requesting that your Senator/Representative vote in favor of vaccines and vaccine funding in order to keep your family safe from deadly but preventable diseases. Learn how you can work with your local or statewide immunization coalition to educate yourself on the specific issues in your state, familiarize yourself with state specific immunization rates and support pro-vaccine legislation. Send us an email at info@ecbt.org and we will gladly connect you to others working these issues in your state. Every Child By Two is one of several organizationsleading the call to Congress to protect critical immunization programs by retaining current public health funds. As we’ve seen in the past few weeks, Congress seems to be getting the message, as several Congressional members shared their own “Dear Colleague” letter which called upon all Congressional leaders to maintain vital immunization funding. (link). But we need individuals like you to join us. Every call and email you make can go a long way in demonstrating the public’s support for strong immunization policies. Thank you for all the work you do on this. Clean water??? 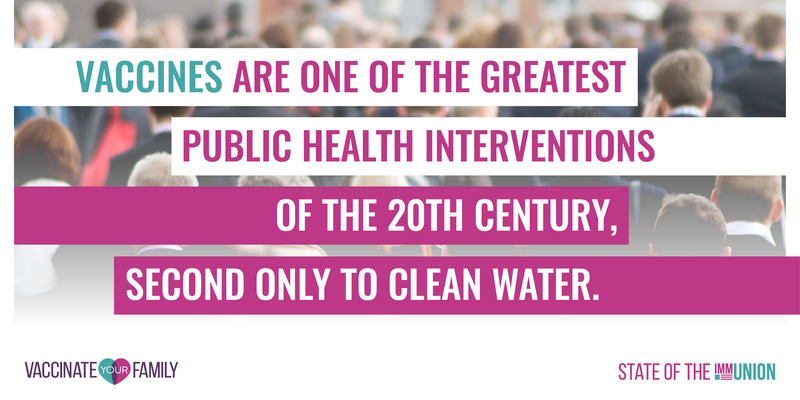 Ask the people of Michigan about clean water. If your comparing vaccines to “clean” water. God help us. 31 people in the Disney Land outbreak had the VACCINE strain of the measles. 25 people in the Disney Land outbreak were verified as vaccinated with immunization records. You can get Measles from the vaccine and you can spread it. Source: This presentation made and distributed by the CA Dept of Health. @peter – your statements are shown to be false in the very link you provided. “Febrile Rash Illness” isn’t measles. And yet another example as to why 3 doses of the MMR vaccine is recommended. Look at it this way, measles is perhaps the most infectious disease on the planet. At Disney, it is possible that thousands of people were exposed, yet the actual number who got sick was very small. Another victory for mass vaccination. If it isn’t measles, then they shouldn’t count it as measles. Most adults are not caught up on their measles vaccinations, and yet, thousands at Disney Land didn’t get measles. Most adults are up to date or had measles as children….the MMR vaccine lasts a very, very long time. They also didn’t count them as “measles.” If you read the actual presentation, they are talking about all of the testing that they did to confirm the individual measles cases (more than 2600 tests done). Out of the 2600 tests, they found 31 cases of febrile rash, which isn’t measles & isn’t being counted as such.